After a disastrous 2016, where the DNC had to borrow money from former presidential nominee Hillary Clinton’s campaign, the party began to bounce back with fundraising efforts in 2018. Chairman Tom Perez even proclaimed that “raised more money in January, for instance, of 2018 than any January in our history.” That claim, based on $6 million raised by the DNC and $1 million by a separate fundraising group, was an exaggeration and omitted key facts, according to the Washington Post’s Fact Checker. The party raised more than $7 million in January 2010, 2011, and 2012. “If the question is, ‘Do we have enough money to implement our game plan?’ Absolutely,” Perez said. 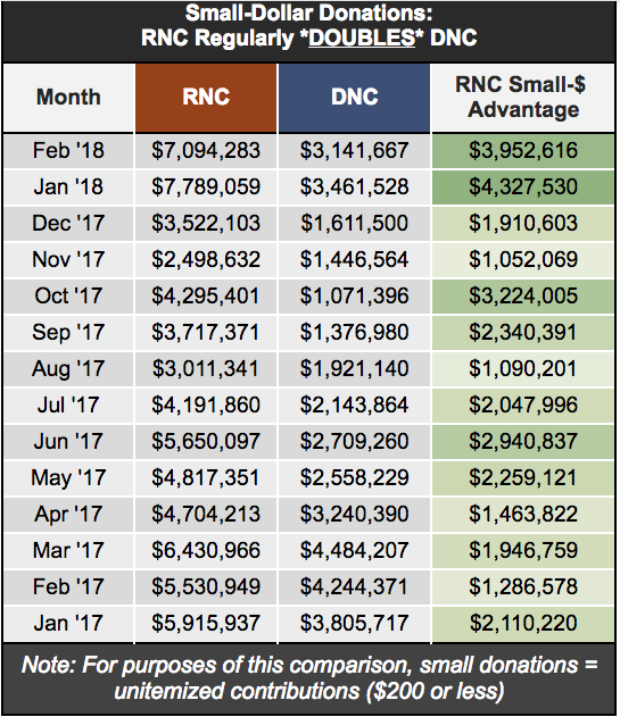 The Republicans regularly make double what the Democrats raise in donations from donations under $200, according to data compiled by the RNC. The DNC did not immediately return The Daily Caller News Foundation’s request for comment.